Today our baby is almost 35 weeks alhamdulillah. I'm in the office typing away because quite frankly I don't have anything better to do, LOL. The semester is finally over and my students just finished their final exams. I'm done with all my marking (wohooo!) 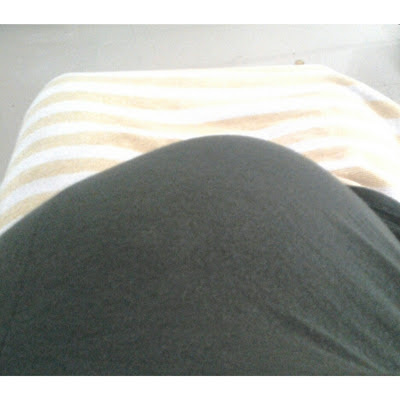 and at the moment waiting for the baby to come out in another 2-5 weeks insyaAllah! My first trimester was a little tiring eventhough I didn't experience any morning sickness whatsoever. My second trimester went very smoothly alhamdulillah and I was pretty much just eating all the time! hehe.. Third trimester has been quite painful especially having experienced extreme pelvic girdle pain which extends to the buttocks and legs. There are times when I just can't move at all when it hits right at the nerve. Also during the night, I usually don't get much sleep because I tend to wake up every hour due to pain or a positional discomfort. I know it's normal for a pregnant women to be experiencing all this, but it's my first time and it's making me wish the baby would come out sooner! LOL. Anyway, I've had the worst morning sickness in my first trimester that I had to take long leaves. However things have been going really well in my third trimester except that yes carrying extra weight lead to some serious back pain and pelvic pain. I haven't been blessed with a baby yet, but I was with my elder sister for a lot of her first pregnancy, so I can appreciate what you are going through. You are really blessed to have such an understanding and helpful husband and I can see why you have fallen even more in love with him. May Allah (subhana wa ta'ala) help you to give problem-free birth to a fine healthy new Muslim, and may He protect and bless you, your husband and your son. Ameen. I have just found your You Tube channel and loved watching the videos of your wedding. It looked wonderful. thank you gorgeous mommy! ameeen..
"but it's my first time and it's making me wish the baby would come out sooner! " almost every first time pregnant women I know said this Looooool! Aw! This post is lovely and heart touching, I'm praying for you and your husband to have a healthy baby :) take care. Salam, been following your blog for quite a while. hang in there ya dear :-) , pray that labour will go smoothly for you. Baby will be out before you know it, and you'll be smiling ears to ears. Motherhood will be challenging too, but nothing beats the feeling of being a mother, you have my words for it! Salaam! Mashallah may allah make everything run smoothly ameen. I just found your blog and it's really great! I'm following you via GFC now and would love it if you could visit my new blog and maybe even follow back via GFC or bloglovin'? Praying for you. I'm happy for you. MachAllah. InshaAllah hope everything goes smooth sister! Just came across your blog- mashaAllah fashionista AND lecturer AND mom-to-be inshaAllah! May Allah make it easy and smooth for you!